The Imitation Game - WHAT is ENIGMA? 2. HOW DOES ENIGMA WORK? 11. WAS THERE a SPY in HUT 8? This photo of a 4-rotor Enigma machine gives us a view of the rotors, the lamp board, the keyboard and a small view of the plugboard. Online via the U.S. Air Force Network Integration Center. Photo credit: AF ISR Agency History Office. Click on the image for a better view. During the 1920s, Polish Cipher-Bureau employees were monitoring radio signals relating to German military exercises. Then - on the 28th of July, 1928 - Polish code breakers were no longer able to decipher German dispatches. The letters, used in the German codes, appeared too random to be selected by humans. It seemed, to the Poles, that the Germans might be using a machine to create their ciphers. In fact, at that time, the Germans were using a cipher machine. Highly restricted from rearming and rebuilding the country’s military, after accepting the terms of the Versailles Treaty, Germany needed to keep its military rearming and rebuilding a secret from its neighbors. Using a commercially available machine known as “Engima,” converted to insure its encryptions were even more secure, the new machine was perfect for military use. What was this encryption device? Could it be used to transmit and receive unbreakable coded messages? In 1918, as World War I was ending, Arthur Scherbius, a German engineer, invented a rotor machine. He was not the first, however, to create an encryption machine using rotors. Scherbius likely expanded on the work of two Dutch naval officers - Theo A. van Hengel (1875-1939) and R.P.C Sprengler (1875-1955) - who produced rotor-based cipher machines for the Dutch Ministerie van Oorlog (Ministry of War) in 1915. Since no one patented those Dutch-made cipher machines, they could be freely copied by anyone ... including the country’s adversaries. As he improved his machine, Scherbius acquired the rights to a rotor-based design invented by another Dutchman, Hugo Koch (who’d applied for a patent in October, 1919). 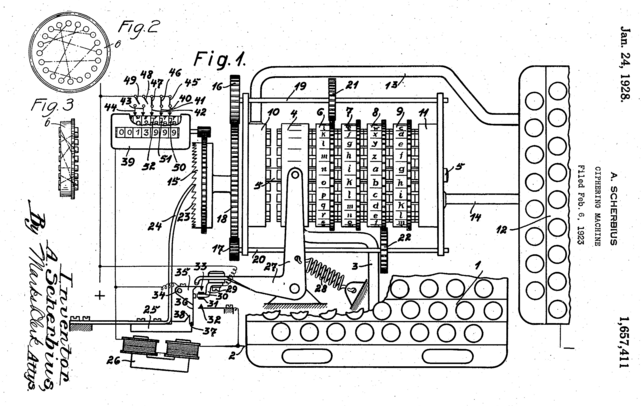 By 1923, Scherbius was ready to introduce the Enigma machine as a commercial product. Incorporating his company as Chiffriermaschinen Aktiengesellschaft, Scherbius thought the German military would be among his eager customers. Although the military wasn’t initially interested, by 1928 things had changed. Scherbius was even issued a patent in America, seen below (Patent 1,657,411). Then ... because of an error, made by someone in Berlin, a newly improved Enigma-for-the-military ended-up in the hands of the Poles. But ... having the Enigma machine in-hand was not enough for the Polish Cipher Bureau to decode German messages. Someone had to figure-out how the machine was wired. How did it actually work? How did the sender of messages and the receiver of messages communicate? Let’s investigate the math behind the machine. Bos, Carole "WHAT is ENIGMA?" AwesomeStories.com. Dec 31, 2014. Apr 18, 2019. When Is Open-Source Better Than Getting a Patent for New Inventions? Is Giving Credit a Moral Obligation When Using Open-Source Information?